Gulf Coast Chemical, a specialty chemical and packaging distributor, has signed a distribution agreement with GMA. StanChem Polymers has appointed John Mulhearne as Sales Director - Emulsion Polymers. 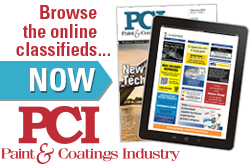 Specialty chemicals distributor Peninsula Polymers announced that Dwayne Michaels has joined the company's sales team. Eurocolour – the European umbrella organization of the pigments, fillers and dyes industry – has a new organization.